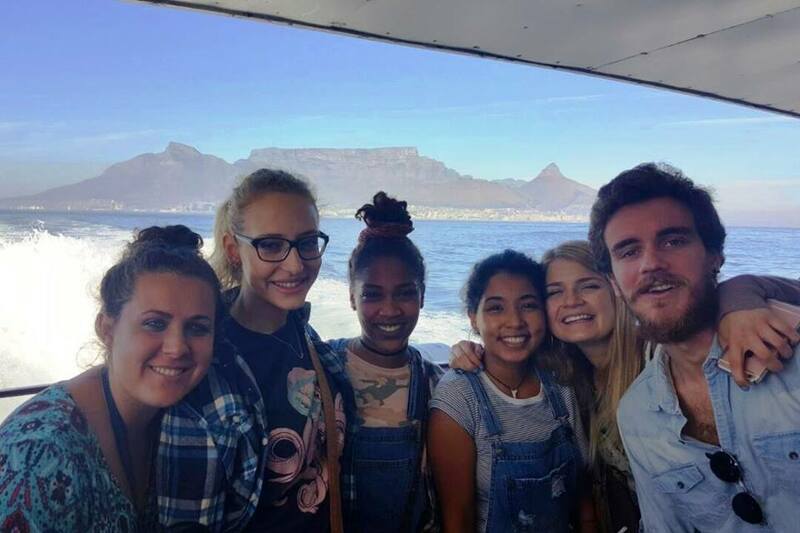 On one of the many historical tours I have joined in South Africa, I had a gentleman say that “because we [the touring group] were from the United States” he could “reveal insight that he doesn’t bring up with white South Africans” since we were “outsiders and wouldn’t be offended to the truth”. This comment truly made me understand the still existent racial boundaries in the present nation as he delved into the ‘black Zulu’ perspective of living through apartheid and the aftermath specific to the Kwazulu Natal region of the nation. Although tension is often high between racial groups even to this day, efforts are being conducted to curve this backwards thinking from ALL parties in the years after legalized segregation. One such strategy was the production of the Apartheid museum (that I was lucky to visit in Johannesburg), where all racial stories were expressed in relation to people’s identities. 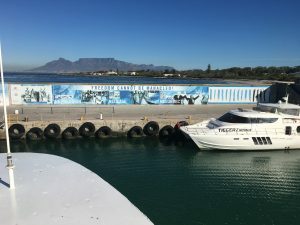 Additionally, I found my IES sponsored tour to the infamous Robben Island to be a beacon for hope in the years to come with regards to race relations. 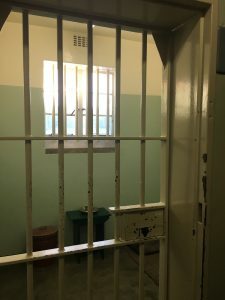 Robben Island is well-known for its brutal working conditions imposed upon the prisoners along with its position as being the ultimate prison similar to the likes of Alcatraz. Sitting almost 14 kilometers from the coast of Cape Town, the icy water and sharks prevent escape. Only one record of successful escape was documented occurring in the seventeenth century. In the past fifty years, this island was the center of much global discussion (near the end of apartheid) when Nelson Mandela and lesser world-known freedom fighters were finally released. Today the prison has been preserved as a place to remember the hardships of the past and steer visitors to imagine a positive future for South Africa. We were lucky to be able to hear the preserved stories of a past political prisoner. Our group started the journey to the island by taking the ferry from the Waterfront. We took a guided bus tour to view the developments on the island. At the center was a quarry that past prisoners had been forced to work upon. It was in the shelter of the cave, during resting time,that prisoners were transformed. It was during break times that conversations took place that altered the history of the nation. Our guide explained how many consider the island a ‘college’, whereby individuals of various backgrounds with strong differing opinions were forced to converse and develop a common understanding. The political prisoners were mixed with the criminals; as criminals were released back into society, they themselves had become political activists against apartheid. Our tour led us to walking inside the halls of the prison. We saw the cell of Nelson Mandela and many freedom fighters who helped end the struggle in 1991. We were exposed to the altering mindset of the first democratic president of South Africa as it was explained that the young Mandela refused to ‘renounce violence as a means to end apartheid’. It was in time reflecting in prison and conversing with others that Mandela altered his strategy to conduct a future without violence or revenge against the oppressor but rather with peace and reconciliation. This transformation in thought of a revered leader demonstrates the human capacity for change in the path towards racial reconciliation. While a little over twenty years have gone by and much progress has been achieved there is still much work to be done. The fight for equality has been picked up by the youth; activism has begun at the collegiate level. During my time at the University of Cape Town I have observed the general call for decolonizing the nation. The end of apartheid successfully ended legal segregation; however, neighborhoods in present society are still mostly grouped by race with co-existing socio-economic statuses as during the likes of apartheid. Additionally, the university is a learning environment geared towards the rest of the world. Much of the student body feel like the establishment is ashamed to be located on the African continent. Much frustration arises from the fact that classes revolve solely on Western ideology and the promise for free education is out of reach as tuition is continuously increasing. Sitting at the center of campus up until 2015 was a Cecil Rhodes statue commemorating his donation of lands to supply the university with property. However, Rhodes was a dominating colonizer who spared little concern for the local African people. Students found his ‘presence’ on the campus disheartening and sought to remove the statue. 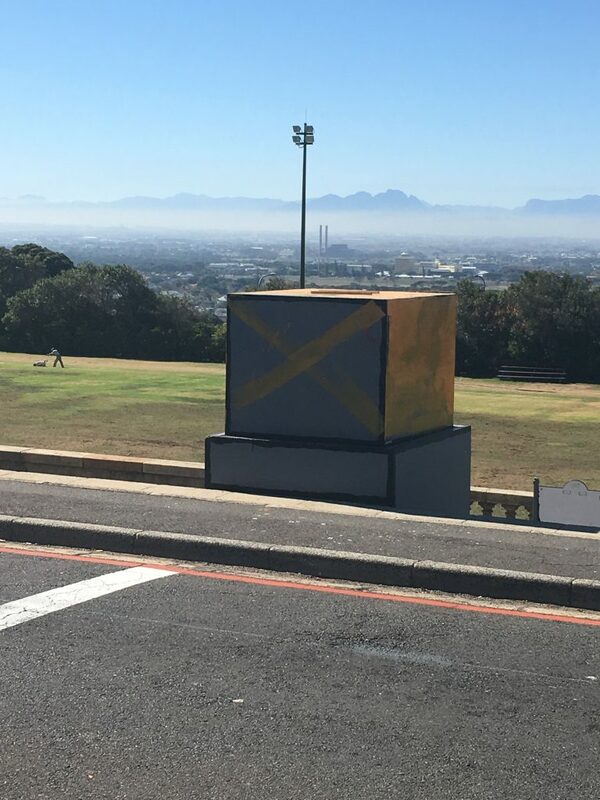 Protesting reached new levels under the banner #RhodesMustFall. A national phenomenon occurred when the campus responded to the movement by in fact removing the statue. This sparked further motivation in the students as the call to lower fees was necessary along with the addition of more housing for students. The campus currently only has around 7,000 spots for residents and hosts around 30,000 students. Last semester the #FeesMustFall protesting shut down the school for a month and in response the government placed a hold on pricing. Although small acts of student activism were observed this semester, the call to decolonize was predominantly discussion based. With the government due to release the following years tuition we will see what the future brings with regards to next semester. While I was in Cape Town I was in a situation where, in addition to student frustration with politics, the entire nation was upset with the actions of the President. 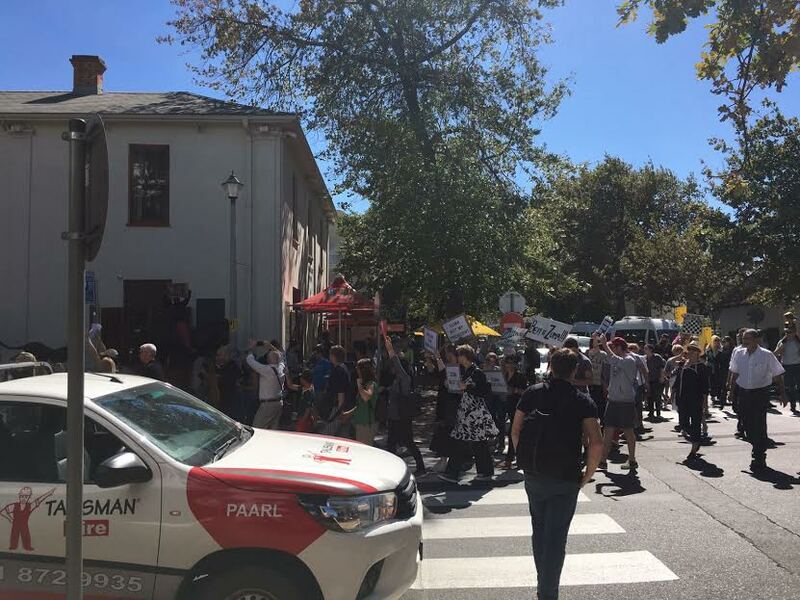 Piggybacking off of the student-led movements, a national march broke out across the nation under #ZumaMustFall. This march extended into smaller regions of the country, even in the wine lands of Stellenbosch. With the reshuffling of office members by President Zuma coinciding with the rand (national currency) being deemed junk status as the national treasurer was removed, the likes of all races came together to show their disapproval. The ability for all races to come together to stand up to a common cause gives me hope for the future of the nation. I believe my discussions around students reflections and transformation in the aftermath of large scale student movement was life-changing. I don’t want to have to return home as an ‘outsider’ to hear the truth of people’s stories. I want to be open to continue paving the pathway towards understanding in my own backyard.